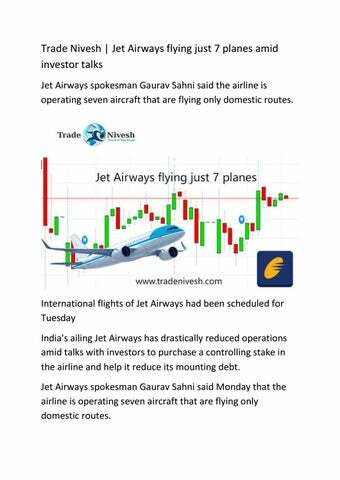 Trade Nivesh | Jet Airways flying just 7 planes amid investor talks Jet Airways spokesman Gaurav Sahni said the airline is operating seven aircraft that are flying only domestic routes. International flights of Jet Airways had been scheduled for Tuesday India's ailing Jet Airways has drastically reduced operations amid talks with investors to purchase a controlling stake in the airline and help it reduce its mounting debt. Jet Airways spokesman Gaurav Sahni said Monday that the airline is operating seven aircraft that are flying only domestic routes. Sahni said that international flights had been scheduled for Tuesday. Jet Airways chairman Naresh Goyal resigned from the board last month as part of a recovery plan structured by government-owned State Bank of India and other creditors. 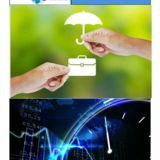 Indian news media reported that Goyal submitted an expression of interest on Friday to make a bid for a controlling stake in the airline. Jet Airways pilots have been demonstrating in Mumbai over lack of pay. Sahni said the demonstration was not expected to affect operations. Jet Airways spokesman Gaurav Sahni said the airline is operating seven aircraft that are flying only domestic routes.